I generally love schlock musical comedy. The emotions are elemental, the humor, raw, the plots, joyfully ridiculous. Yet, is it possible for schlock to be too schlock-y, even for schlock? Of course—and as Exhibit A, I present to you The First (and Last) Musical On Mars, onstage now at New Rock Theater. New Rock rocked Chicago twice with its utterly gnarly and awesome crowd-pleaser, Point Break Live! (our review ★★★). But it seems that they’ve taken this fledgling comedy review too early from its nest. Written and composed by former Sirius Satellite Radio spoken word maven George Zarr and directed by Kevin Hanna (musical direction Robert Ollis), The First (and Last) Musical On Mars still looks like it doesn’t quite know what it wants to be when in grows up. Angel Tuidor’s costuming and Ellen Ranney’s set design suggest heavy influences from 1970’s David Bowie and Roxy Music. Indeed, the use of glitter is almost blinding. But Zarr’s musical compositions are a hodge-podge of pop and Broadway. In fact, hodge-podge is a nice way of putting it. The tune “Sweet Alien Boy” is overlaid on the chord structure of Jimi Hendrix’s “Foxy Lady,” but its execution just doesn’t rock. The first act finale, “Sibling Rivalry”, can’t be described as anything other than a messy attempt at pop-operetta. As space opera, The First (and Last) Musical On Mars is just too jumbled and patched together to excite. Add awkward scene transitions and the show barely holds together. But it does have a few fun and tender moments. Rock star James (Sam Button-Harrison) is forcibly teleported to Mars for the coronation of twin princesses Hendrixia (Gina Sparacino) and Hollilia (Meghan Phillipp) and, ta-da, romantic entanglements ensue. It’s certainly fab to watch the girls zoom about in their ship to the song “Retro-Rocket Warp Speed.” Once James lands, a few tender, romantic moments stand out with the coy duet between him and Holliliah with “Different Beings, Different Worlds” and Button-Harrison’s warm reprise of “You Take Me to Paradise.” It must be noted that the entire cast’s voice quality is quite above standard for musical comedy review. Now, if they only had the material to match their talents. So far as comedy goes, Matthew Isler’s dry robot servant, Electrolux, stands out–and that’s mostly because he has great miniature signage that he flourishes most effectively. All the same, with the exception of brief one-liners like “Earth guys are easy!” the entire book badly needs a rewrite. 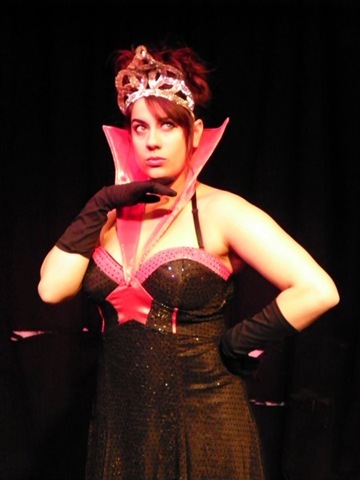 Dallia Funkaster (Casey Kells) and Zabathoo (Leah Tirado) make decent evil villains, attempting to kill the princesses and take over Mars, but that has entirely to do with their level of enthusiasm and not the writing. Meanwhile, the Chorus (Rachel Bonaquisti, Liz Hanford, and Allison Toth) always comes across sweet and lovely, while Jonas Davidow has to be thanked just for wearing a g-string. But it’s back to the drawing board for the creator. Or his venture into the heart of shlock will be, dare I say, lost in space. The First (and Last) Musical on Mars continues through June 19th at New Rock Theater, 3933 N. Elston (map), with performances Fridays and Satrudays at 10pm and Sundays at 8pm. Tickets are $15, and can be purchased by phone (773-639-5316) or online at http://www.newrocktheater.com/tickets.htm. Love me or quit me? 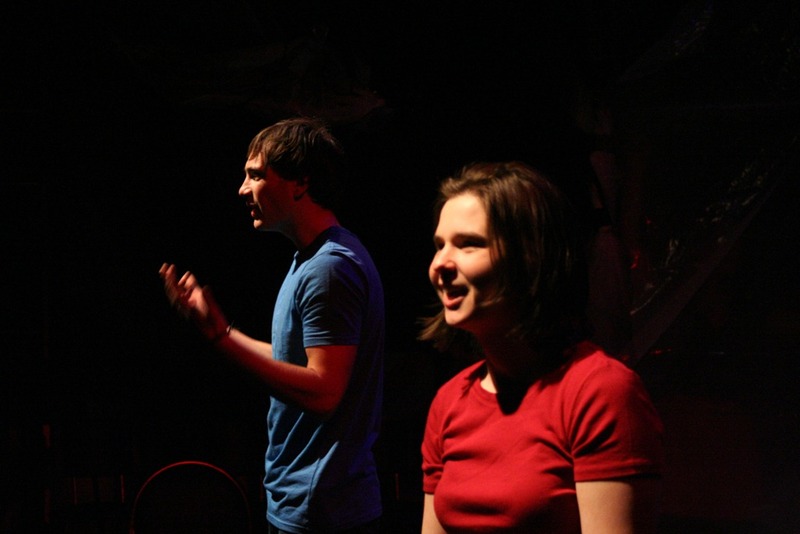 Make Me Love You (an evolution of love), conceived and directed by The Verge Theatre’s Brandon Pape, takes a look at the various stages of love and how it affects those in it and those around it. Love is great while it’s good, but when it goes bad it’s like accidently taking a swig of that sour, curdled milk you left sitting in the fridge three weeks past its due date. With Valentine’s Day thrown into the mix, the Verge takes a look at the good, the bad and the ugly of love. The set, designed by Andréa Ball, is a very industrial space. With scaffolding, exposed lights and wiring and plastic hanging around like drapes and curtains, it creates a cool warehouse vibe. It’s almost like walking into a found space that someone decided to use as a backdrop for their performance, without all the bells and whistles, fancy set pieces and all the flair. 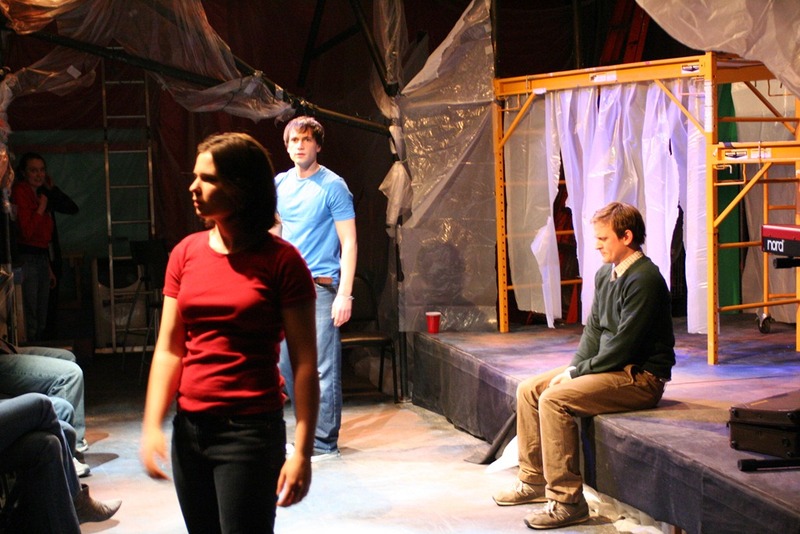 The set also provides a jungle gym of sorts for the actors to swing, run and climb around on as they perform, creating interesting visual levels for the eyes to follow and a perfect opportunity to break through the fourth wall separating cast from audience. Make Me Love You is a combination of three short plays performed and intermixed with poetry by various artists, and music performed live by Paper Thick Walls. It’s an interesting combination of mediums used as a portrayal of relationships and love. The show comes at the notion of love from all angles, literally and figuratively, with the use of so many art forms as well as the actors moving about the space not only in front of the audience but on the sides, behind them and through the aisles. It’s a very visual and sensory experience that, at times, fully engulfs the audience in the action and pulls the emotion through them. 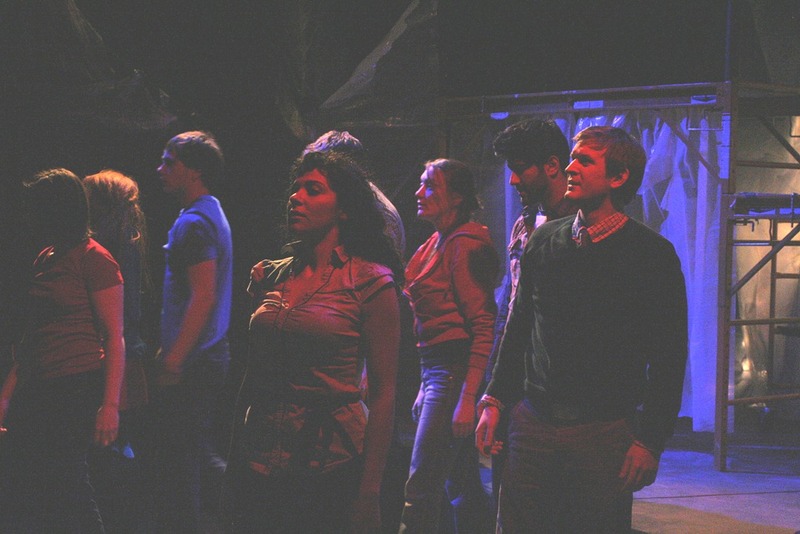 The cast (Kevin Anderson, Rebecca Drew Emmerich, Joe Sultani, Claire Alden, Wes Drummond, Atra Asdou, Tom Scheide and Cathlyn Melvin) does a fine job of keeping the energy high to the pace of the performance is steady and moves along well. Although it keeps moving, there are many points at which there seems to be a disconnect between one scene to the next or different actions. It’s understood the overall underlying theme of Make Me Love You is love and relationships, but at certain points this theme takes on too broad of scope, leaving me wishing for a more concrete arch that connects the various parts of the performance. While appreciating the use of not only the short plays but the poetry and music with dance, some of the poems are powerful and fulfilling while others come across as just words repeated off a page with less force behind a meaning. The performances by Paper Thick Walls and the choreography performed by the cast is interesting to watch and listen to but it is clear that not all of the actors are dancers so some movements are not as sharp. It’s a welcome sight to see that Make Me Love You investigates not only mushy romantic love, but explores what happens when loves fades or makes people act in ways they never otherwise would. It plays into all of the different emotions that spring from love and relationships, taking the performance to different levels to keep the audience engaged. 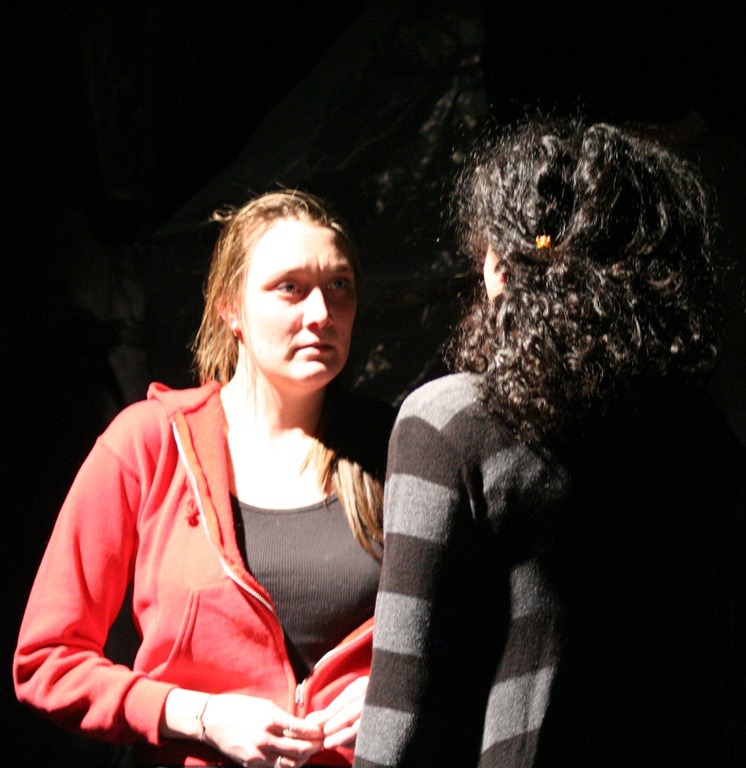 Make Me Love You (an evolution of love) plays at the New Rock Theater, 3933 N. Elston, through February 20. Tickets are $10 general admission and can be purchased by calling (773) 639-5316. 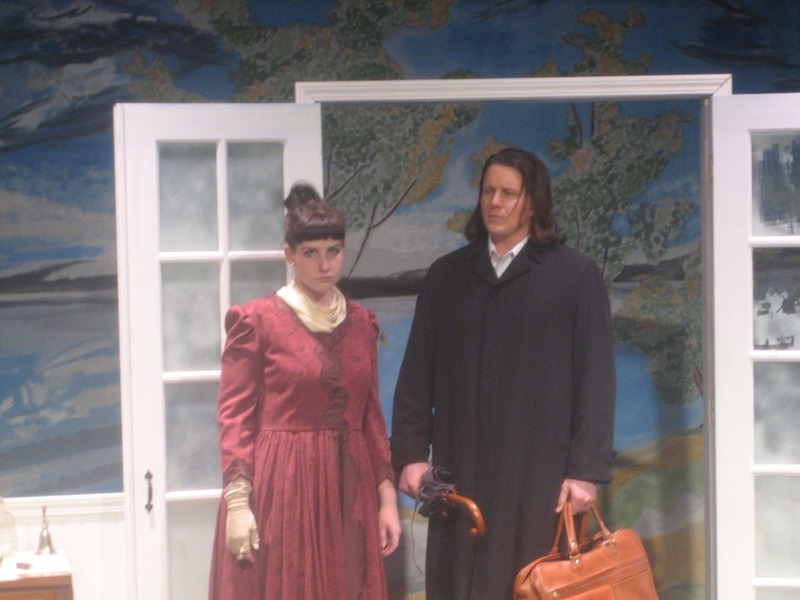 Henrik Ibsen’s Ghosts is a terribly difficult play. It is talkie, chocked full of nuanced emotional twists and laden with the secret shames. Indeed, its characters’ morbid preoccupations with reputation may seem absurd to a modern audience. Take Pastor Manders’ (Robert McConnell) recommendation to Mrs. Alving (Brittany Ellis) that she not insure the orphanage she is setting up in her deceased husband’s honor. Insuring the rest of her mundane property is not a concern but, as the orphanage has been established for a higher purpose, it ought to rely solely upon the protection of God alone. Insuring the orphanage would signal a lack of faith, something the pastor cannot be seen in association with. Deeply concerned for his reputation, since he takes care of the business end of the orphanage, Manders presses Mrs. Alving to forego insurance. Ridiculous, but there it is. Mrs. Alving gives way, with disastrous results. 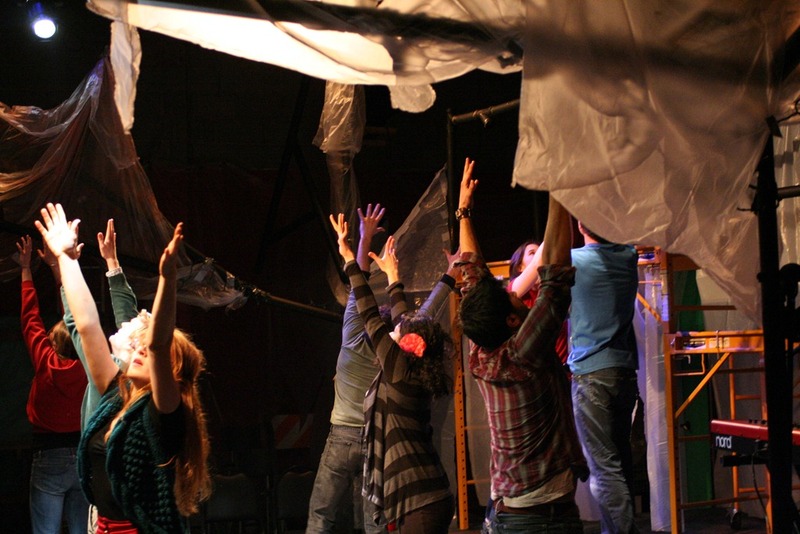 Ghosts is an immensely difficult play to translate to a modern audience, even with mature and experienced actors. Director Derek Bertelsen’s cast is simply too young and green at the start of their careers to give us fully fleshed out 19th-century characters or depict the psychological influences that inform their relationships. Instead, the actors flounder in the sea of Ibsen’s language, often overplaying their roles, then missing important nuances. 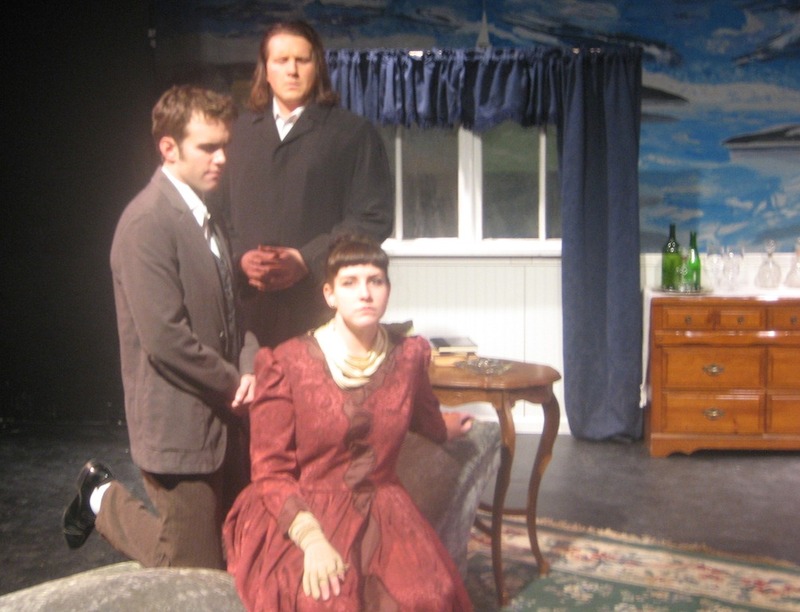 It matters, because when all is said and done, what shocked Ibsen’s audience in his day doesn’t shock us today. After the shock is gone all that’s left are the relationships—like the relationship between a woman and the man she might have loved or the relationship between that woman and her son, who she estranged herself from for his sake. McConnell plays a man stiff in his religious views but the stiffness of his body language and delivery comes across as caricature, not as a human being struggling with the disparity between his moralistic worldview and the reality right before his face. Ellis has some beautifully tender moments revealing the hypocrisy of her marriage to Manders and in her motherly role with her son, Oswald (Jason Nykiel), but that seems to be the extent of her range. Elsa Richardson plays Regina Engstrand with far too obvious flirtatiousness for a servant girl of the period. As her father, Jacob Engstrand, Patrick Doolin seems totally out of his depth, with no sense whatsoever of how to play a conniving, ruthless, old, working-class lecher. The only thing that can be recommended is more acting experience, more research into the period and more lived experience for all involved with the production. As suits the production, Steven Hill’s set and lighting design is quite flat, sparse and unimaginative. New Rock Theater has bitten off more than it can chew with this production. Hopefully this can be a lesson learned about choosing your material wisely. 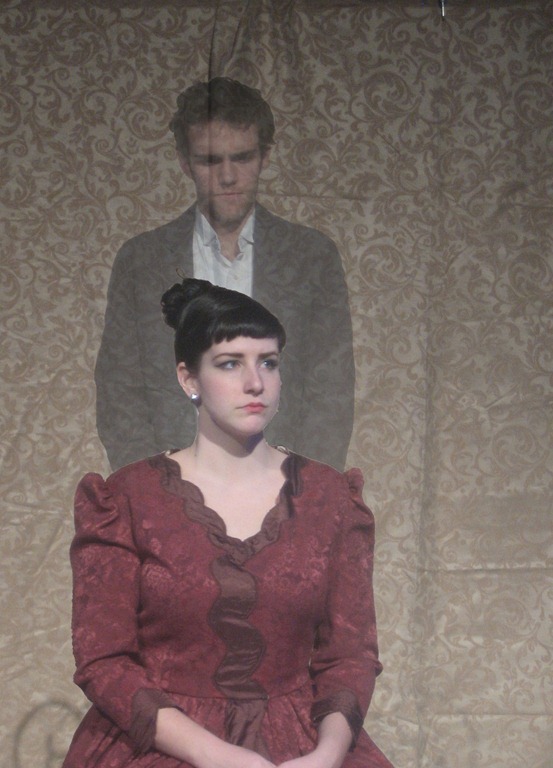 Henrik Ibsen’s Ghosts continues Wednesday, January 26th through Sunday, February 27th. Thursday through Saturday shows 7:00 pm, Sunday matinee 2:00 pm. NO PERFORMANCE ON FEBRUARY 12th Tickets: $20 Regular Admission / $15 for Students or Seniors / Group Rates available. Cash or check only at the door. More info at New Rock Theater’s website.